I don,t know why I have been having trouble accessing the site much more often than not, lately (a month or more). I have tried three different browsers, to no avail. However I happened to think maybe I could get in on my mobile device (IPad). I hope the iPad continues to work because I have missed the forum. My birds have been getting scrappy lately. Usually they get along very well. The only two who just dont like one another are Winter And Silver. 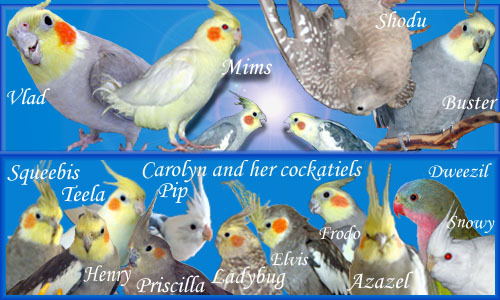 I think it is just because female budgies are usually dominant over the males, but in cockatiels it is the reverse. I have the budgies within their own cage only today, to calm things down. I think their hormone levels are really high. In fact I just saw Piper and Winter enthusiastically mating. If I ever want to have the baby budgie experience, now would be the time. I still have the nest box. I'm not aware of anything that's going on that would interfere with your access. Sometimes there are problems with the server being shut down for maintenance and things of that nature, but it hasn't happened to me lately. I hope that things improve and you're able to keep getting access! If they're hormonal then yes, that would definitely make them scrappy. If you decide to breed the budgies, it's probably a good idea to keep the cockatiels at a distance. Otherwise the tiels might want to investigate the nestbox, and the budgies wouldn't like that. You don't want any nasty fights breaking out! I am still having problems accessing the site, much more often than I can get on. I miss it. For some reason, this morning i am on. I have been thinking that maybe I should just register for a new user name, but I don't see how to do that. If I breed the budgies, I will definitely keep them separate from the tiels. I have had them back on longer nights, and everything has settled down. Truth is, although I think about breeding, I probably will never do it. We'll see. I seem to have problems too, as after I log in the page won't load. However, if I open a new tab/window and come here, I see that I am logged in fine. It is just the page after logging in that won't load. It is not the first time this happens. I remember that last time I logged in I had to open a new window too, and like today I saw I was logged in in the new window. I have to open a new window when I'm logging in as administrator, because the first page never completes the login. But I'm always logged in as a member and don't have any problems getting in the first time when I'm just coming in to look at the threads. I've spent hours trying to figure out what the problem is with the admin login, and can't figure out what the problem is. I contacted customer support and they couldn't figure it out either. So now I just simply log in on one window then open another window so I can actually do something. It's not ideal, but it works. It sounds like the same thing is happening to people who aren't already logged in when they come in. Telling it to keep you logged in should help if you're coming around fairly regularly, but the system may log you out after a long period of inactivity. If you're not already logged in, you'll just have to open a new window after your first attempt to log in. I'd love to fix the login problems, but even the website host can't figure out why this is happening. Yes, I am usually logged out after a long period of inactivity. It is not a big deal, as it is easy to open a new window. It is just weird. I tried to clear the cache etc., but it didn't help, and it appears it is not a problem on "my" computer anyway. I think it's something to do with the server, but they can't figure out what it is. It didn't always do this, but it suddenly started doing it maybe a year ago. I hadn't changed anything, so it wasn't because of something that I did. I'm hoping that someday it will suddenly stop doing it.